The leaves are starting to turn color and fall to the ground. The weather is turning cooler. Days are getting shorter and school is back in session. Yes, FALL has arrived! This week at Club Kids we will be making lots of fall crafts, reading books and even play in leaves to kick off this beautiful season. We hope to see you all this week! It’s Fire Prevention Week and Club Kids is the place to go! We will have crafts like fire trucks, fire people, Dalmatians and more. Along with that we will have books, sensory and work out to go with the theme. We will also be working on out Stop, Drop & Rolls and talking about fire safety. Monday is Columbus Day and there will be a craft to go along with that as well. It’s going to be a jam packed week of fun-Don’t miss it! Little ghosts, goblins, super heroes and princesses will come knocking on our doors in search of a trick or treat. 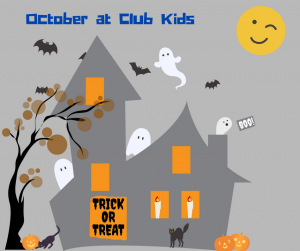 Club Kids is having 2 weeks full of Halloween fun! Join us for lots of not-so-scary crafts that will make great Halloween décor too. There will be lots of books, songs and exercises like the Bat Flaps, Cat Stretches, Mummy Roll and our sensory tub will be full of spiders & webs. And if you stop by on Halloween, we’ll have a fun treat for the little ones!